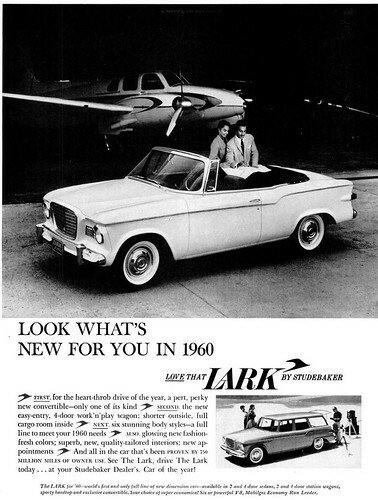 The Studeblogger: Studebaker Ad of the Week, #5: Lark takes flight! 1960 Lark by Studebaker Automobile Advertisement - Ebony Magazine, December, 1959, a photo by vieilles_annonces on Flickr. A great example of Studebaker's early 60s' marketing. Here's a December, 1959 ad from Ebony magazine, showing people of color in an upscale setting, enjoying the beauty and power of their new Lark. I love the little touches, like the Lark logos as paragraph markers in the copy block, and the subtle lighting on the plane. Studebaker Ad of the Week, #3: Avanti! Where can I find Studebaker parts?